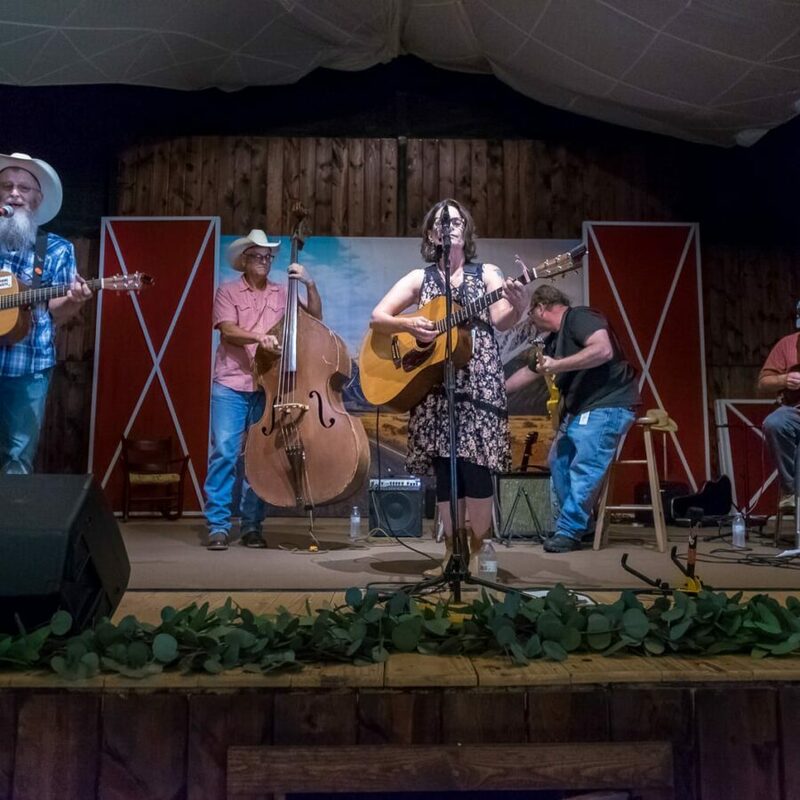 Making their Woodyfest debut,﻿ Lucky num­ber thir­teen in our Woodyfest 2018 cov­er­age fea­tures Tulsa-based Gypsy Twang. Gypsy Twang played the Hen House stage Friday after­noon . 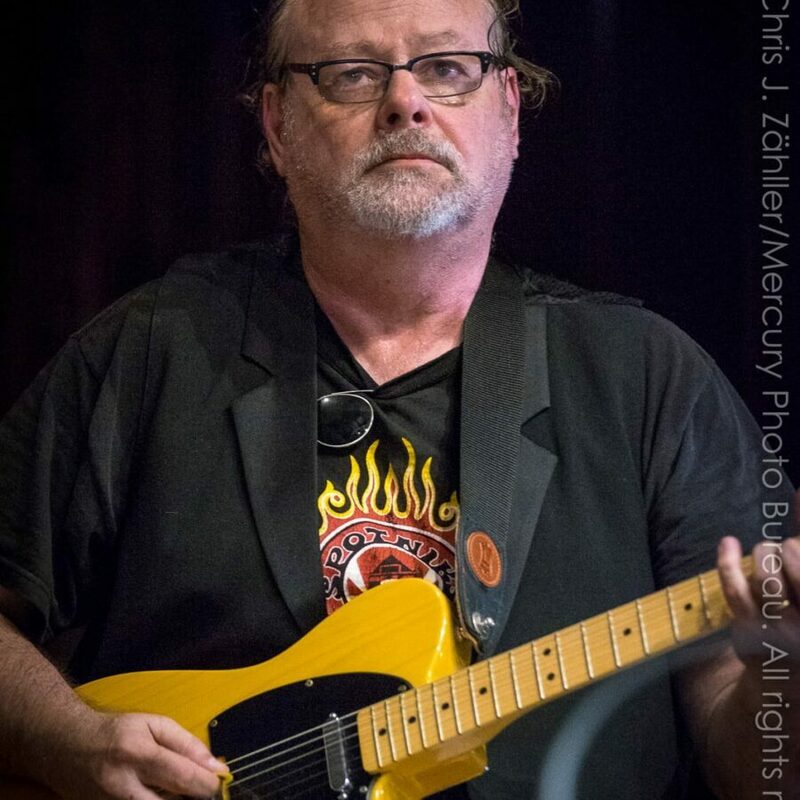 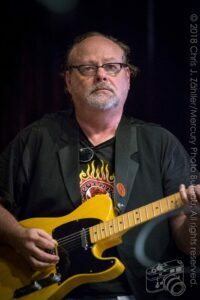 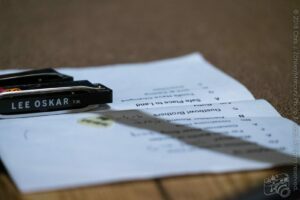 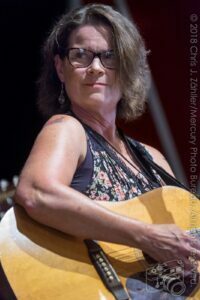 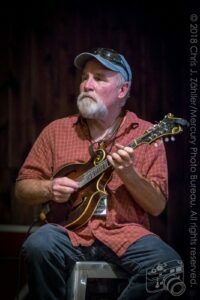 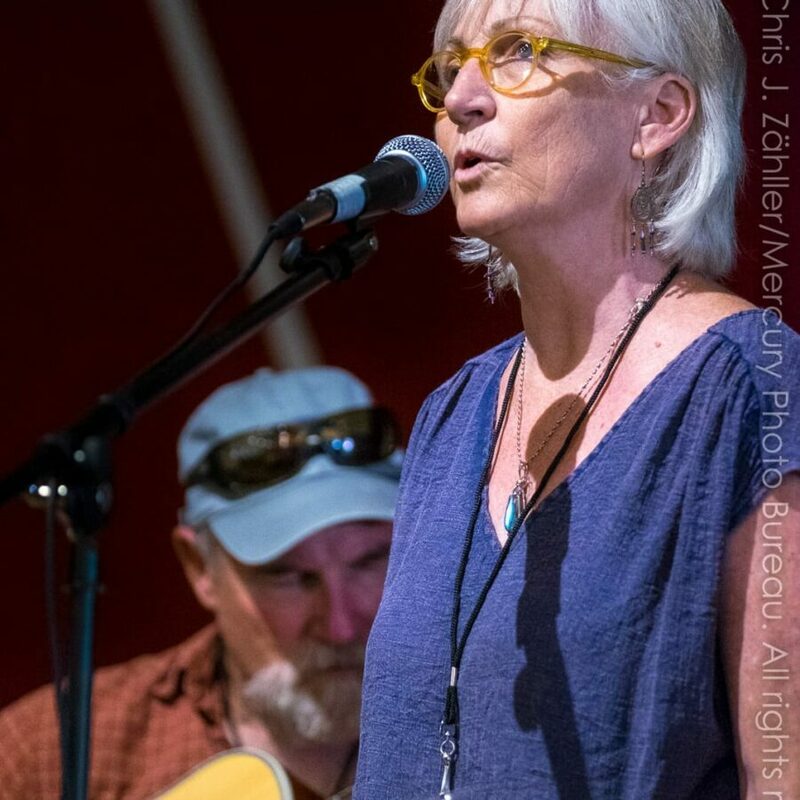 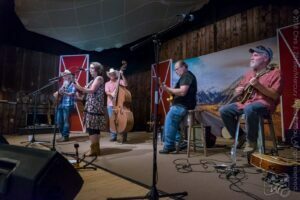 Husband and wife Steve Huhn (bass) and Sarah Barker-Huhn (gui­tar, vocals), along with John Williams (gui­tar, har­mon­ica, voice) shared the stage with guests George Barton (man­dolin) and Kurt “Frenchie” Nielson. 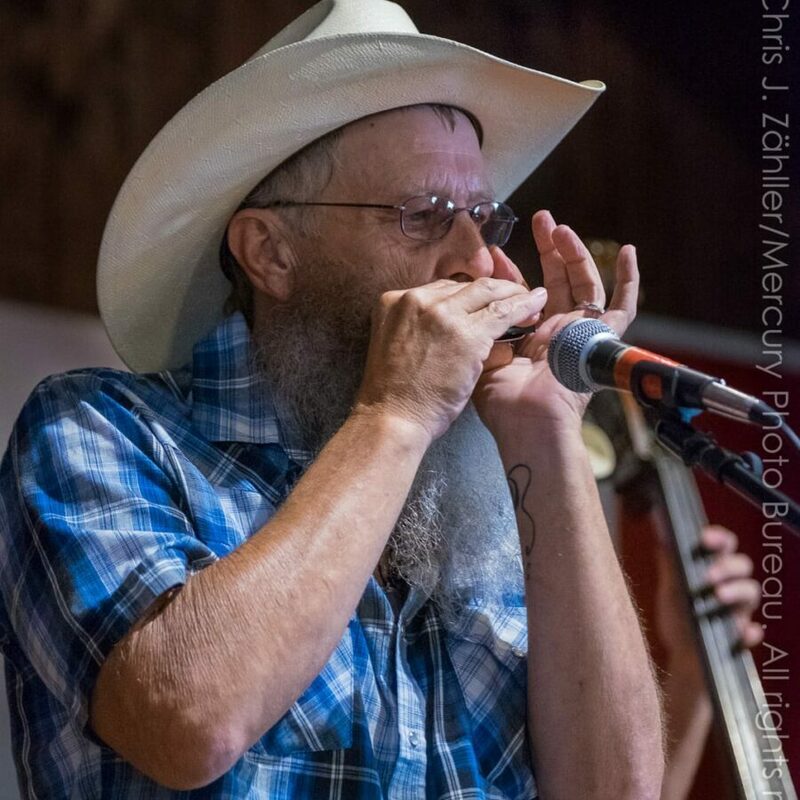 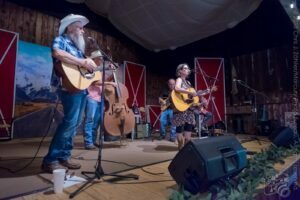 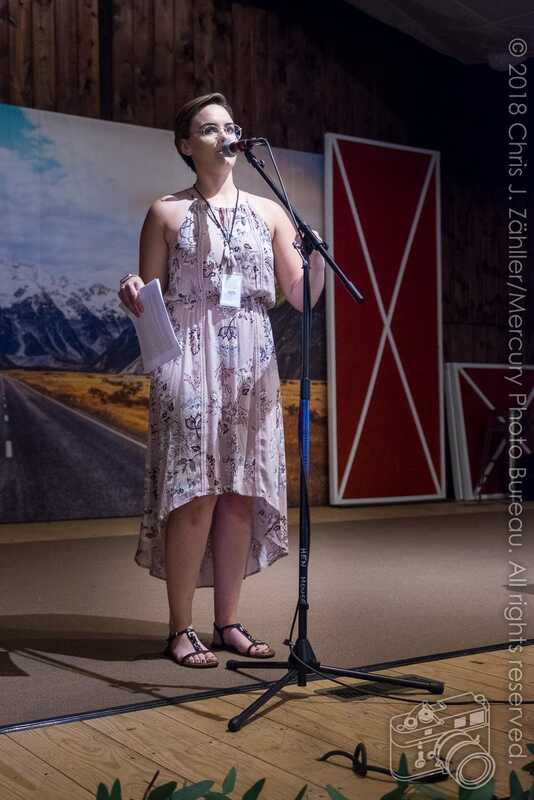 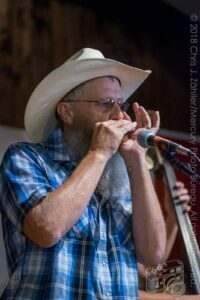 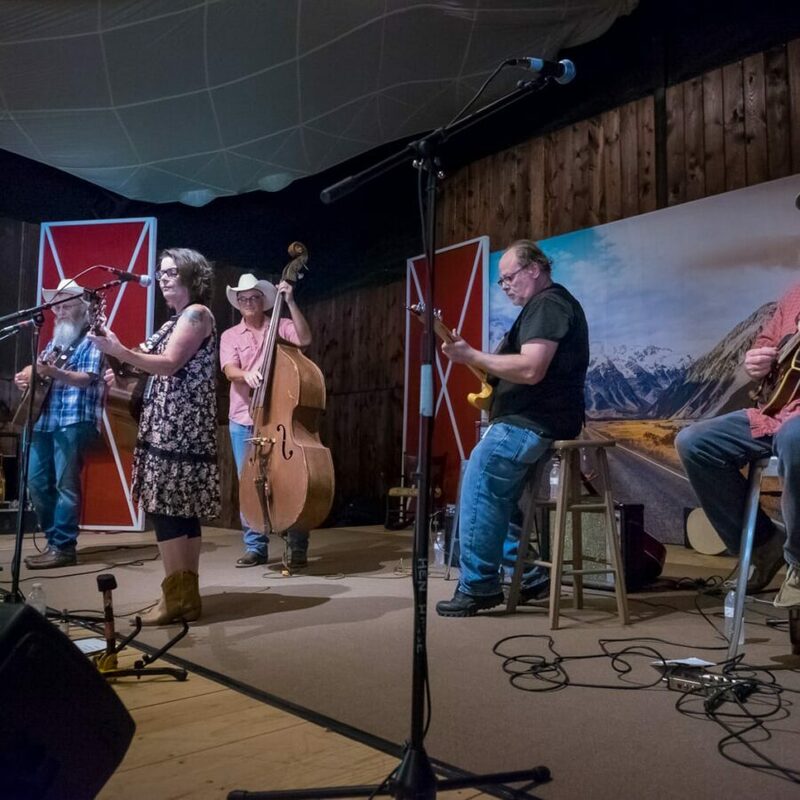 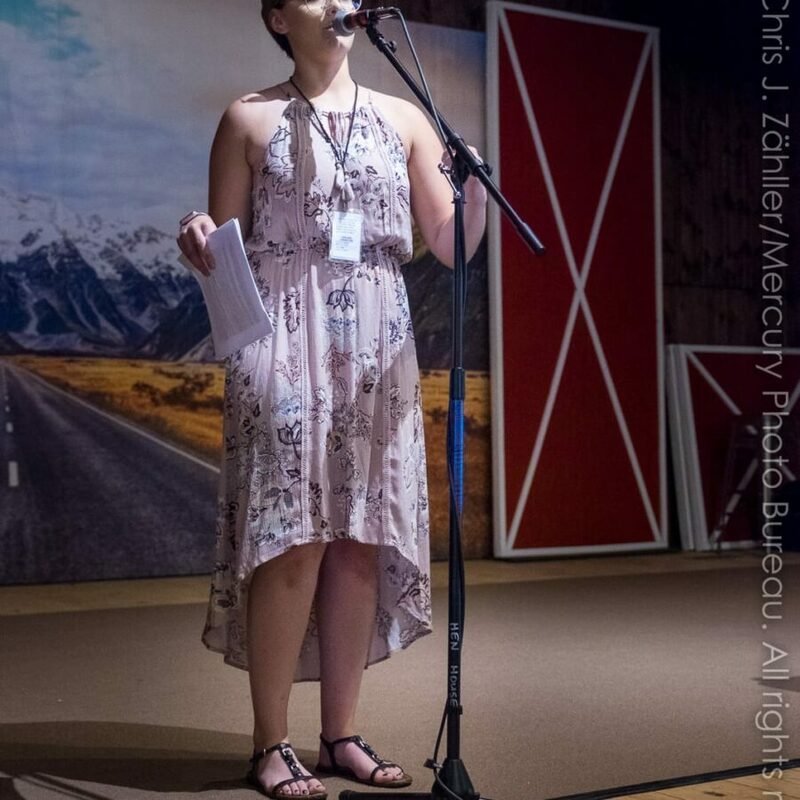 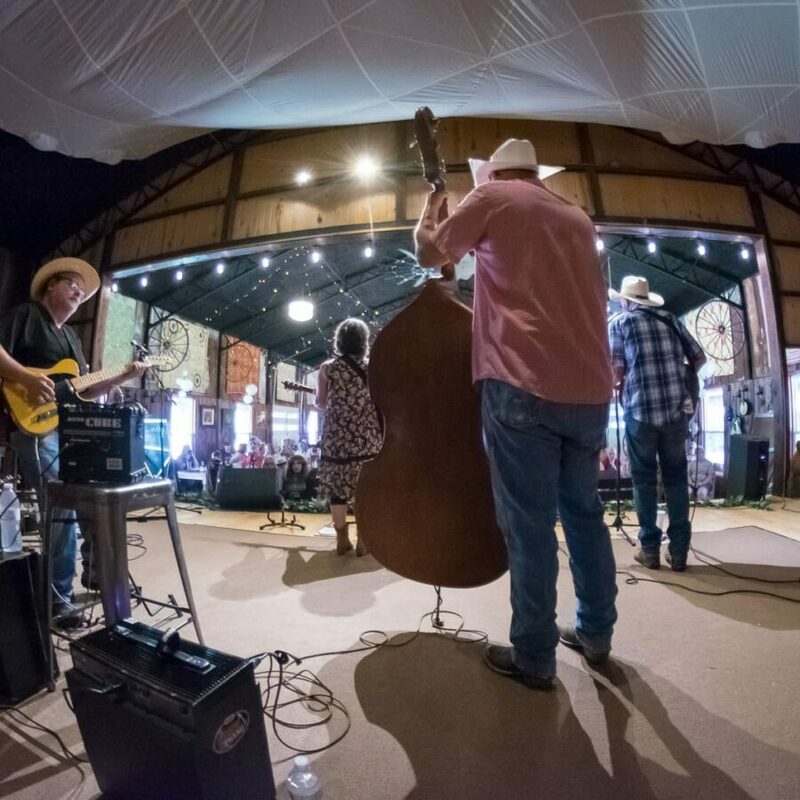 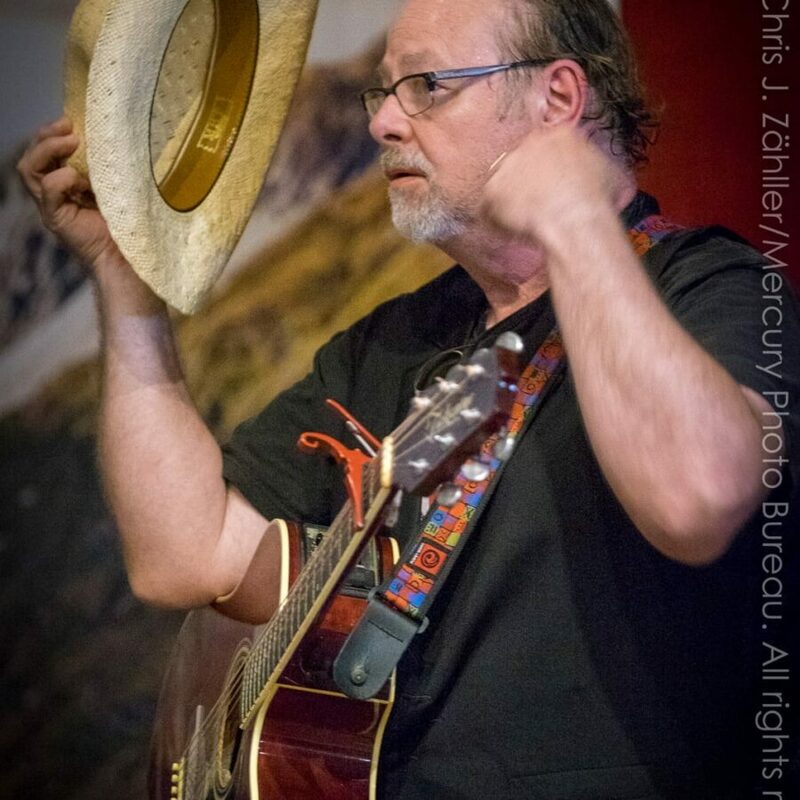 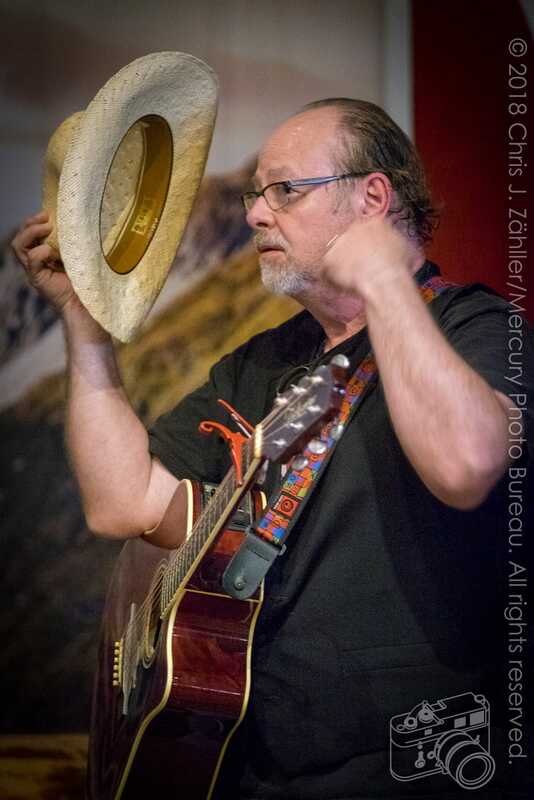 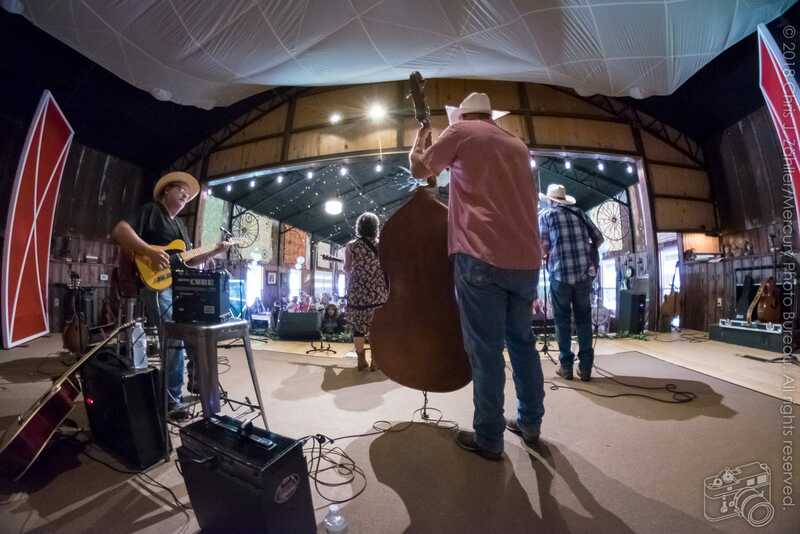 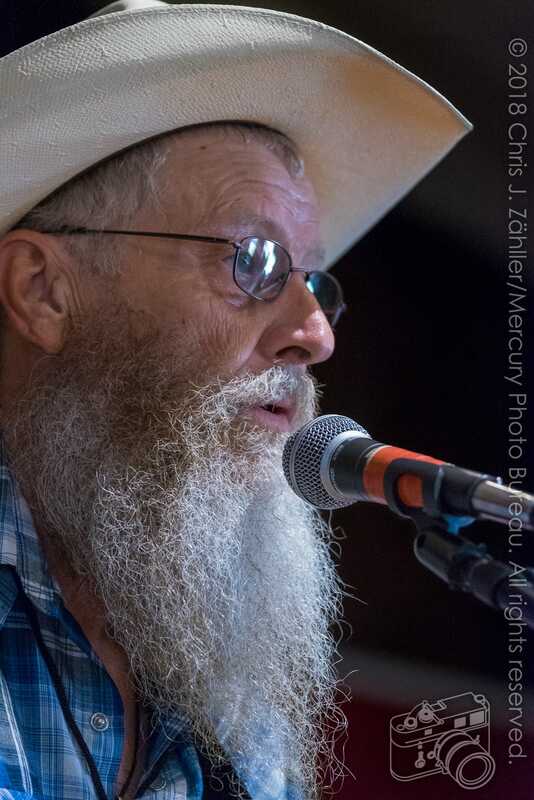 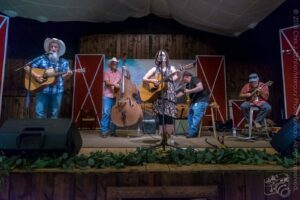 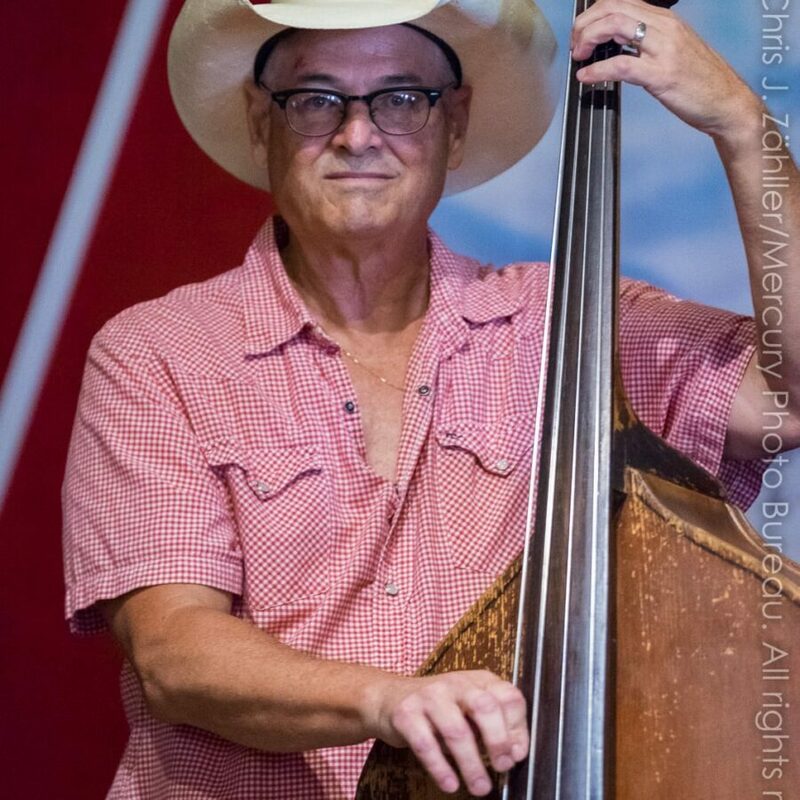 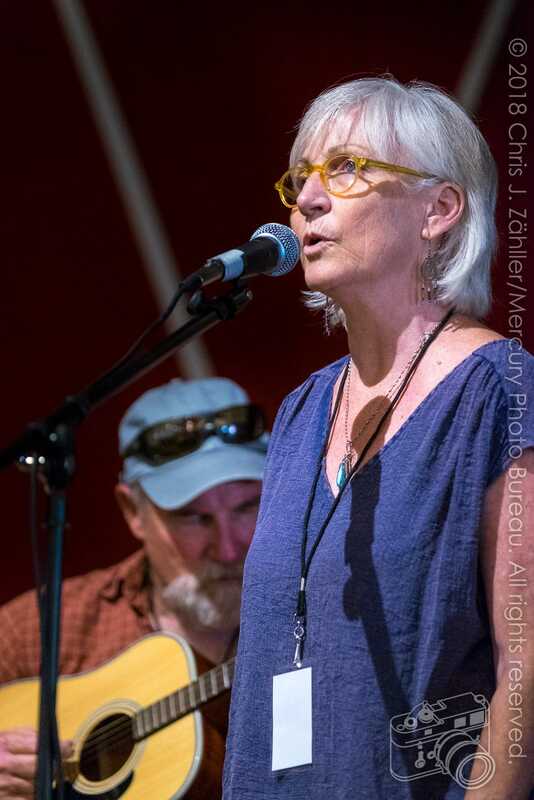 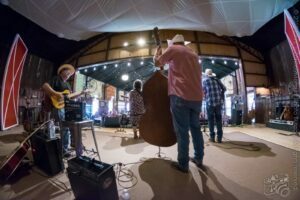 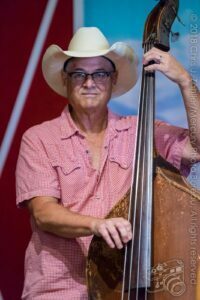 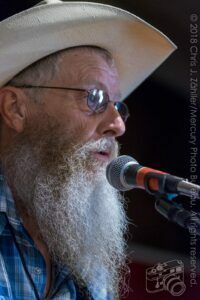 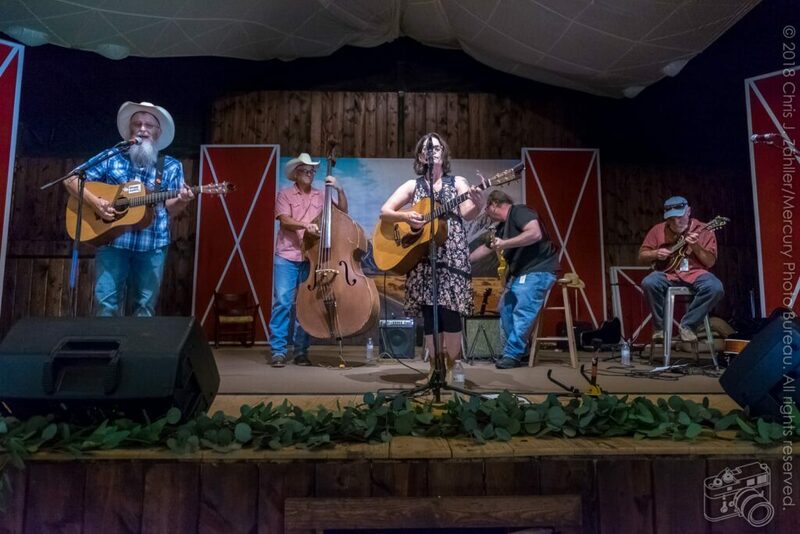 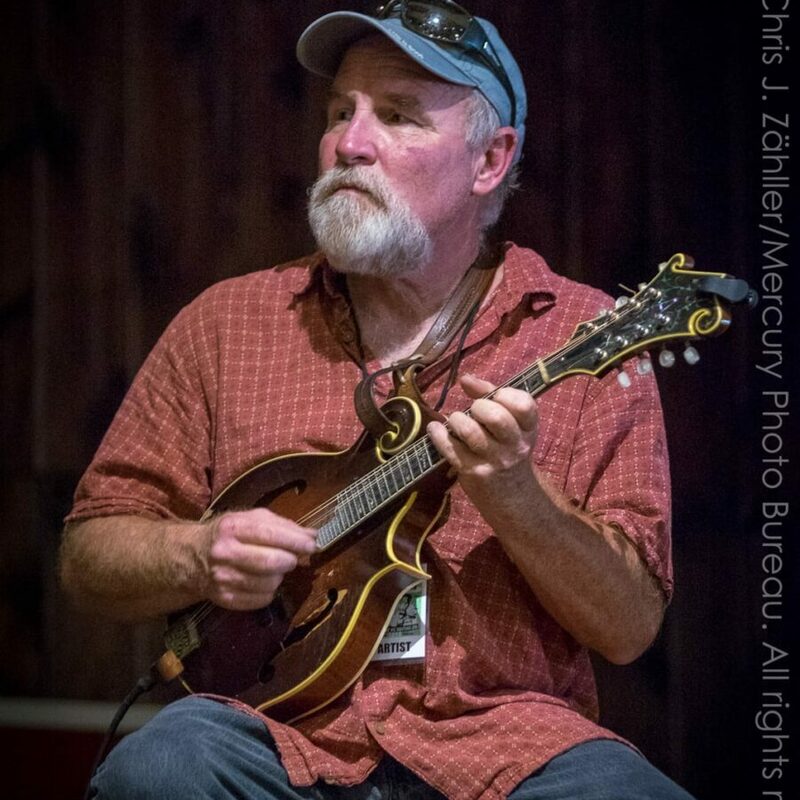 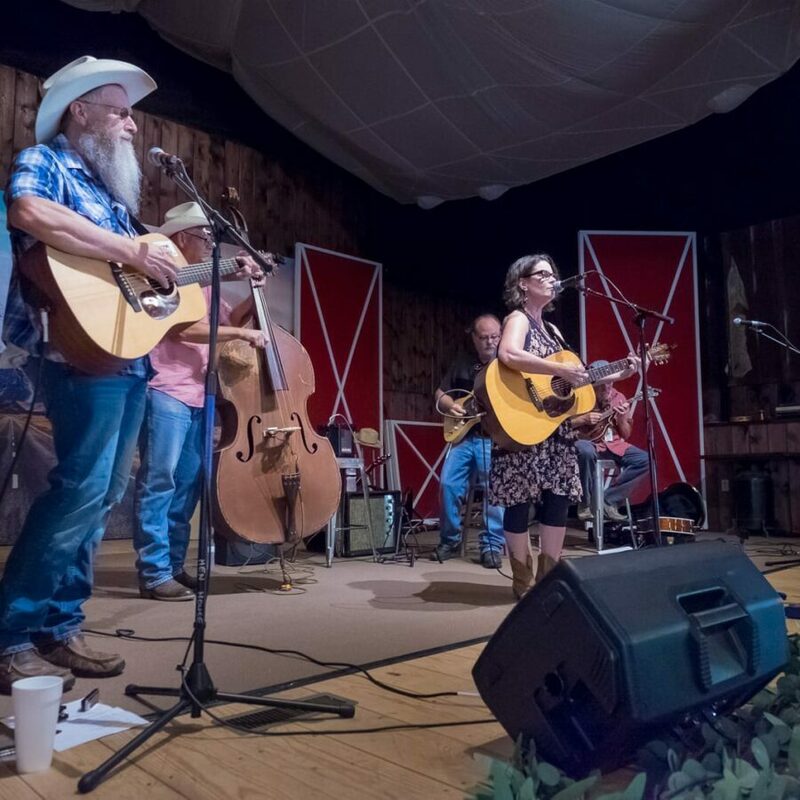 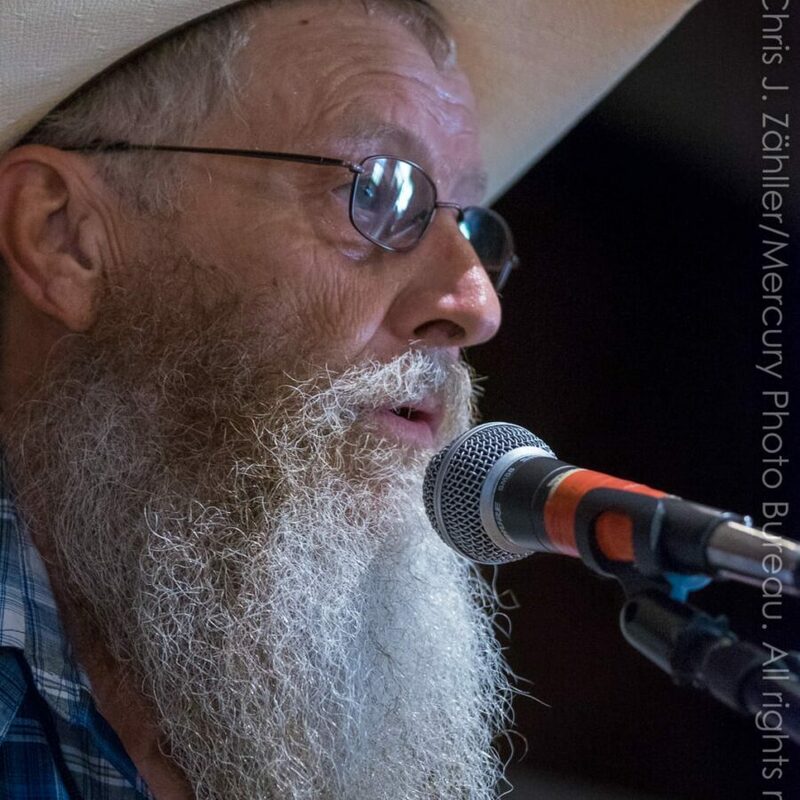 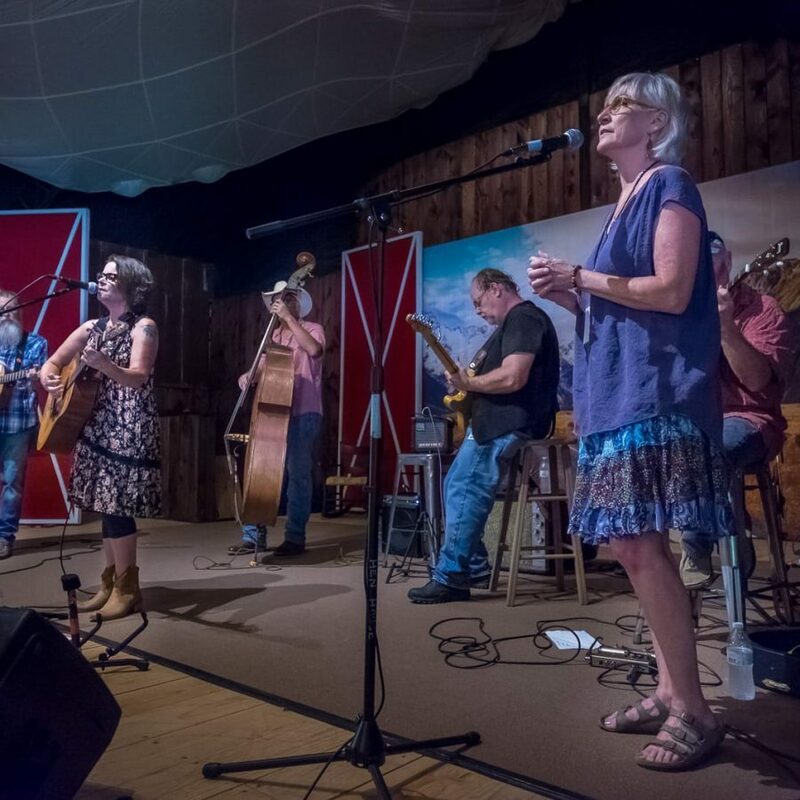 They played a mix of orig­i­nals, penned mostly by Barker-Huhn and Williams, tra­di­tional folk and coun­try tunes, Red Dirt, country-swing, alt-country, and Americana num­bers. 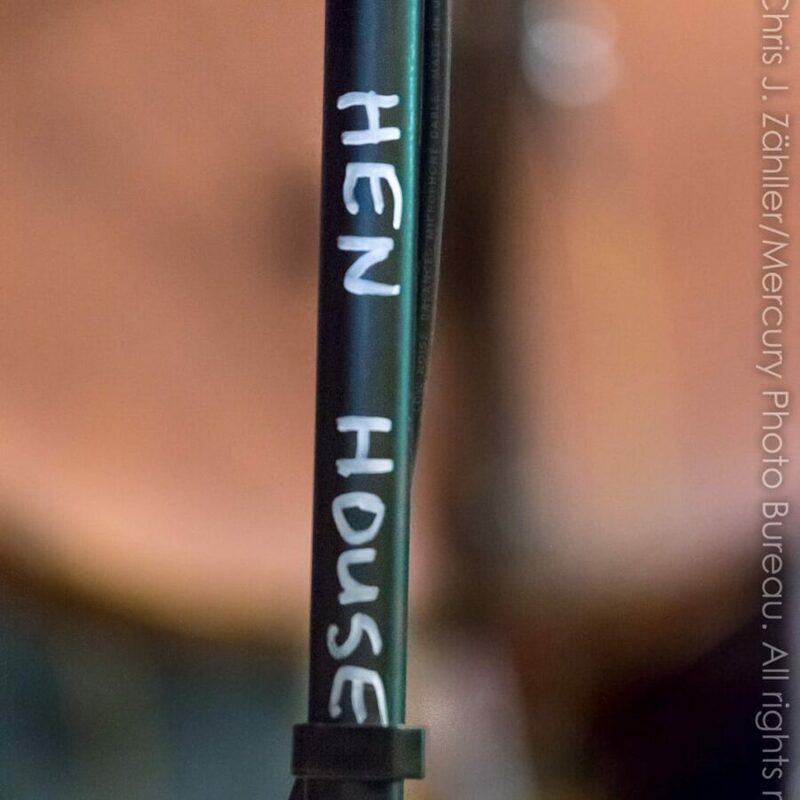 According to the band bio, Huhn’s father played boogie-woogie piano, impart­ing young Steve with a taste for jazz and stan­dards from the Great American Songbook, while Barker-Huhn grew up lis­ten­ing to her father’s coun­try & west­ern clas­sics. 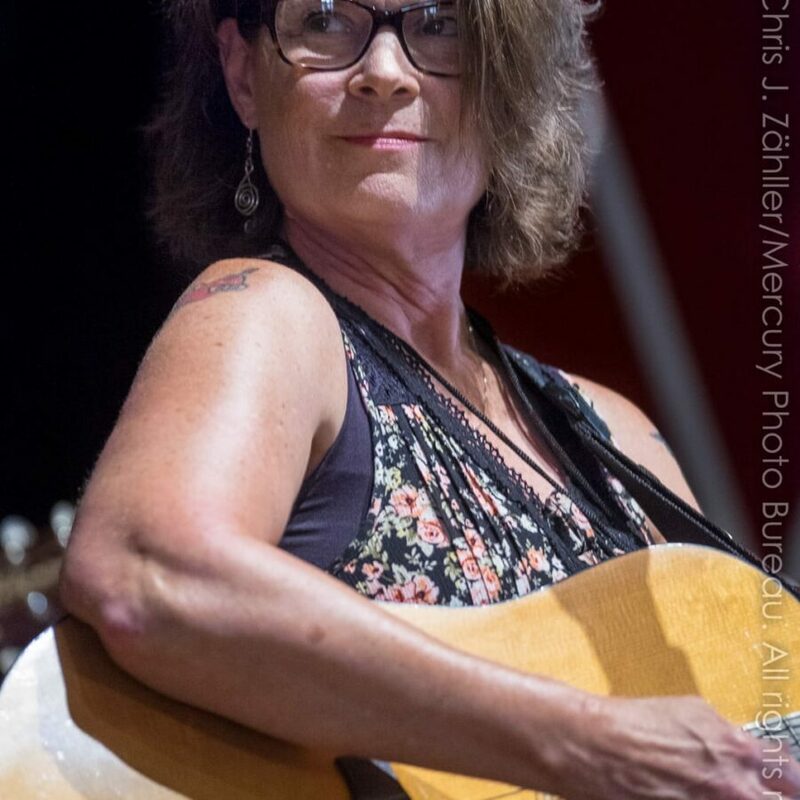 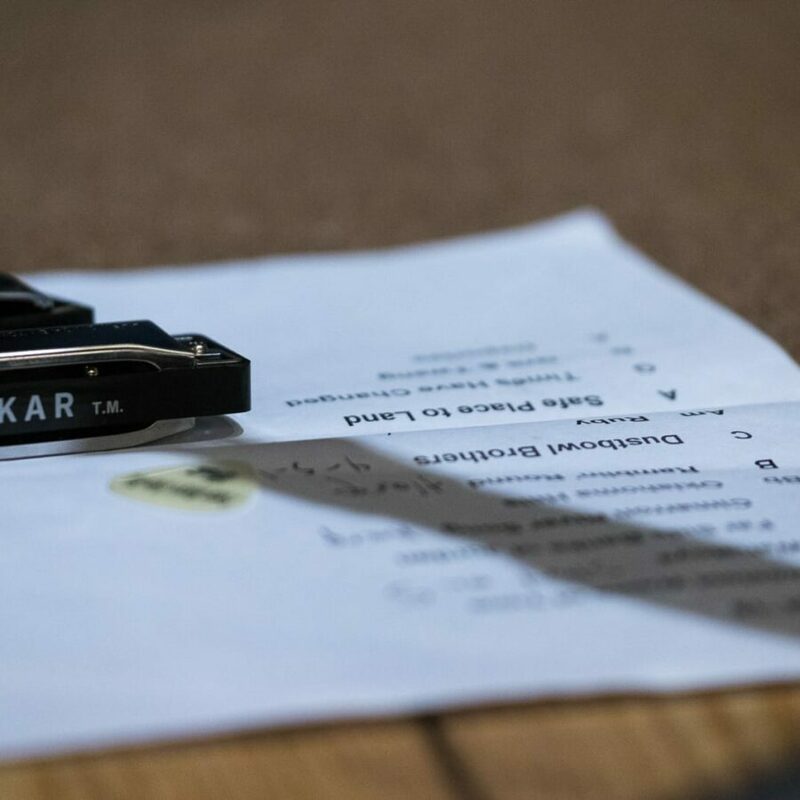 Barker-Huhn picked up the gui­tar later than most — she was in her for­ties — and took to song­writ­ing almost imme­di­ately after. 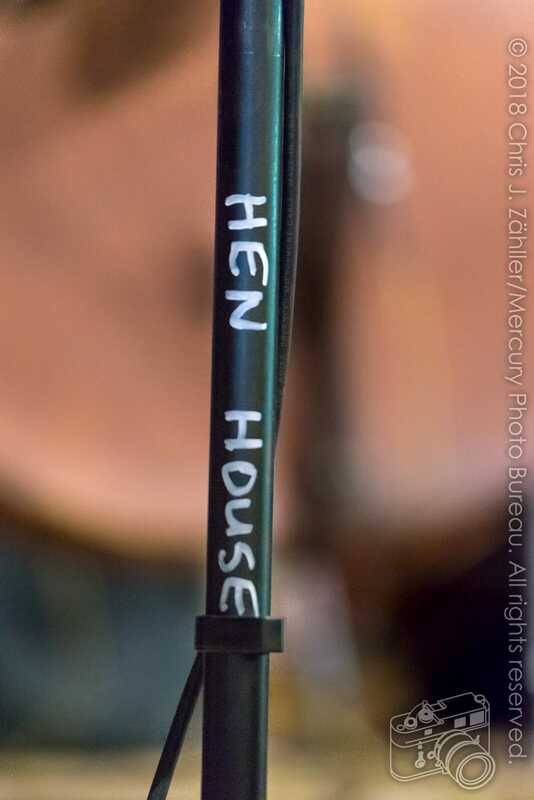 While the band played, Hen House employ­ees scram­bled to keep up with the influx of din­ers, some of whom were there for the music, oth­ers being locals who just wanted some­thing for lunch. 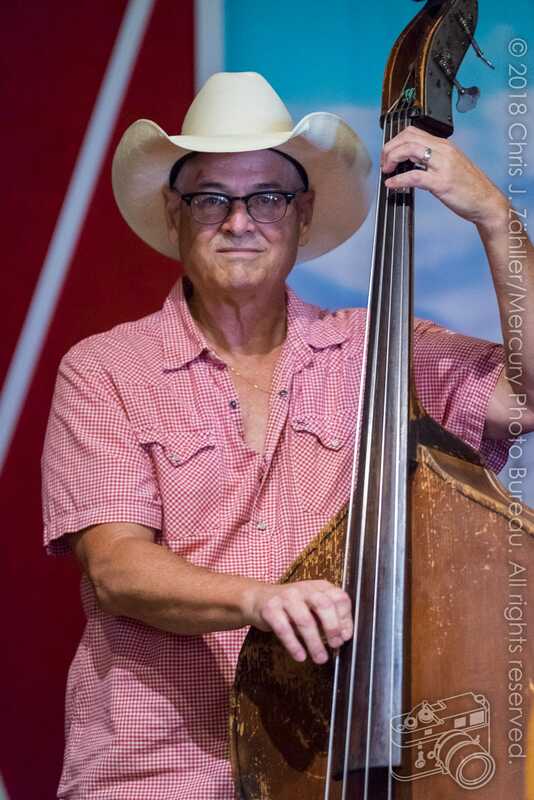 I sus­pect some were there to get out of the blasted noon­day heat. In any case, the audi­ence in the large hall seemed to enjoy them­selves. Toward the end of the set, the band invited Linda Long Barton (singer and per­cus­sion­ist at Barton & Long) to join them on a cou­ple of num­bers. Gypsy Twang were estab­lished in May of 2009 . 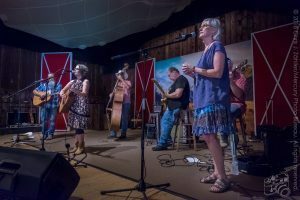 They played their first show at Lambrusco’z, a Tulsa deli that has since become a well-established music venue.